In the USA, laws passed in 1976 and 1998 ensure that virtually nothing ever enters the public domain, but it's a different story in the rest of the world -- for now, at least. In Canada, copyright endures for 50 years after the author's death, so this year, Canada is getting a bumper-crop of public domain works, including the works of TS Eliot, Winston Churchill, Nat King Cole, Malcolm X, Edward R Murrow, Spike Jones, Sonny Boy Williamson, Shirley Jackson, Albert Schweitzer, Fred Quimby and Somerset Maugham. But Canada is on the verge of signing the Trans Pacific Partnership, which forces all 12 countries to sink to the level of the American program. If Canada signs on, this'll be the last year that Canada gets any new public domain works, until 2036. Meanwhile, the rest of the world is getting its own New Year's present for the public domain, while the Americans continue to wall themselves off from the freedom to make new works by interpreting old ones, to do deep scholarly research, to adapt works to assistive formats for disabled people, and to produce cheaper editions that can find their way into the hands of the record numbers of Americans living in poverty. Despite these criticisms, the US has repeatedly pursued efforts to “harmonize” the rest of the world around 70 year copyright terms. 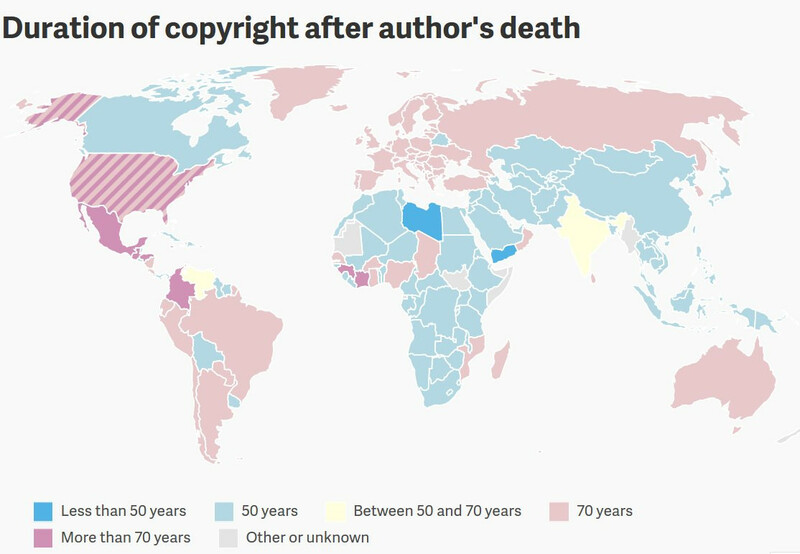 The latest such effort is the Trans-Pacific Partnership, which, if ratified, would require its 12 signatories to adopt a minimum copyright term of 70 years after death. If that happens, works by André Breton and Evelyn Waugh would not enter the public domain in Canada next year, as they are currently expected. It will ensure a smaller, sadder Public Domain Day for them—but at least Americans would have their northern neighbors to commiserate with.